Emails arrive today from both Matt Albert at Yachting Partners International and Kevin Merrigan at Northrop and Johnson to say that they're now joint central agents for the sale of the 40.24m motor yacht Monte Carlo. Monte Carlo was delivered by Amels in 1998 as Princess Tina and accommodates up to 10 guests in a master, VIP, double and twin and also has a sofa bed in the skylounge. 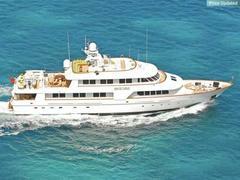 She had a complete interior refit by Claudette Bonville in 2006 with updated mechanical systems. This superyacht had her five-year commercial class survey in 2008 and is MCA compliant and ready to cruise, asking $5.9 million.